Following the success of Seaforth's Ship Craft series, this new strand of Flight Craft titles are sure to appeal to a broad demographic of model makers. With profiles of the various craft accompanied by a descriptive narrative history of the various types, this volume combines practical information with reflective historical analysis, making for a visually rich volume sure to appeal to both sides of the market. 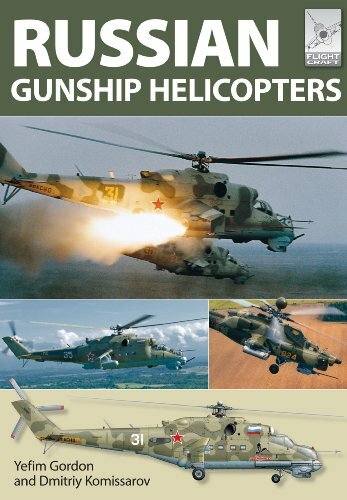 This volume deals primarily with the three principal attack helicopter types of the present-day Russian Army. The Mil MI-24 'Hind' - otherwise known as 'the Flying Crocodile' - has been produced in large numbers with many versions and variants developed. It has been supplied to a host of countries and seen considerable combat action in conflicts both in the Soviet Union and abroad. It still forms the backbone of army aviation in Russia. At the forefront of national exposure, this is a particularly pertinent inclusion in a volume such as this. The Mil-28 is a more contemporary type and is broadly the equivalent of the McDonnell Douglas AH-64 Apache. Again, this is a popular type and fans of the craft will find much of interest here, whether they are curious to expand their historical knowledge or eager for design details in a model-making context. Finally, the Kamov Ka-52 'Alligator' - NATO name 'Hokum-B' - is in service with the Army and entering service also with the Russian Navy. Another exciting craft, its inclusion in this volume and the spotlight afforded it by Gordon are both well deserved. Well-illustrated histories and structural analyses are supplemented with detailed descriptions of the various plastic scale model kits which have been released, along with commentary concerning their accuracy and available modifications and decals. This level of detail and insight is sure to prove invaluable to a wide community of model-makers, both at home and overseas.